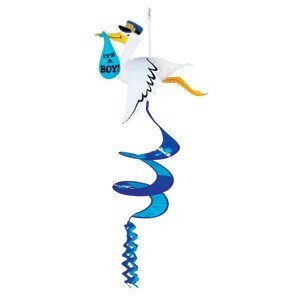 Welcome guests when they come to visit your new baby boy with the Stork It's A Boy Wind-Spinner. The 42 inch wind-spinner will be sure to catch the eye of all your friends and neighbors with it's bold blue colors and cute flying stork design. Hang it from your porch roof or decorate a corner of your nursery using the Party Stick Ceiling Hooks.